I've been pretty busy with writing and editing and such, and haven't had a chance to participate in Susanna Hill's Perfect Picture Book Friday in a while. SO VERY glad I'm making time to do it today - as this book has been sitting on my desk for at least a week or two, waiting for the chance to be featured. And the time has FINALLY come! 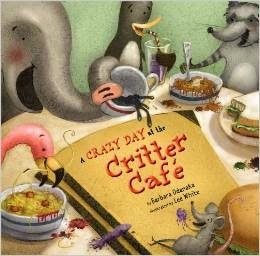 First Page:"It was a quiet morning at the Critter Cafe. The cook was dozing in his cheese souffle. The waiter was whistling sleepy tunes when through the door walked three raccoons." Synopsis: Swish, zoom, swish. Clickety-clack! When a bus full of critters breaks down, a sleepy roadside café suddenly wakes up! Raccoons, elephants, zebras, and rams are only a few of the many animals demanding grub, and it is all that a cook and a waiter can do to keep up. But when Skateboard Cow swerves her way through the crowd, more than a few feathers are guaranteed to be ruffled! Rhythmic text and energetic illustrations combine for a romp of pure fun and entertainment. Resources: I found a couple free printables for this book here. Here is another cute idea for making word burgers. Having the kids play restaurant would also work. Why I LOVE it: The voice is fabulous, the pace is fast and TOTALLY fun, and the story absolutely delightful and silly and relateable (to kids - yeah, that's it). And the end surprised me delightfully. The art AND words are a super combination. Just plain fun ! I'm a big fan of Lee White's illustrations. I can't wait to get a better look at this book. I love the catchy title. Thanks! Just plain fun works for me every time! Sweet pick. Word burgers is a fabulous idea too! Don't they sound fun? And easy too! Thanks for stopping by, Julie! This looks like plain old fun! Who wouldn't want to visit a cafe with all those crazy animals. And word burgers? need to check those out. It is TONS of fun, Sue! Hope you get a look - and thanks for stopping by! What great fun! Great title and story. Sorry I missed your post. No worries :) I didn't get to them all last week. Thanks for popping in!